Mangroves provide a number of important ecosystem services to humanity but their persistence is threatened from deforestation, conversion, and climate change. The Mahakam Delta was once among the largest mangrove forests in Southeast Asia comprising 2% of Indonesias total mangroves. Currently, about 62% of this extensive mangrove in the Mahakam Delta has been lost mainly due to conversion into aquaculture. To understand the impacts of mangrove conversion on carbon losses and therefore their values in climate change mitigation, we sampled 10 intact mangroves and 10 abandoned shrimp ponds to quantify: (1) the total ecosystem carbon stocks; (2) potential CO2 emissions arising from mangrove conversion to shrimp ponds; and (3) the land use carbon footprints of shrimp production. The mean ecosystem carbon stocks in shrimp ponds (499 ± 56 Mg C ha-1) was less than half of the relatively intact mangroves (1023 ± 87 Mg C ha-1). This equates to a potential annual emission factor over 16 years following mangrove conversion of 120 Mg CO2e ha-1 yr-1, which is similar with the total carbon loss from land conversion in freshwater tropical peat swamp forests. Inclusion of C losses from land use/cover change in a life cycle analysis (i.e., the land use carbon footprint) resulted in an estimated 2250 kg CO2-e emitted for every kg of shrimp produced in mangrove-converted ponds. Conversion of mangroves to shrimp ponds in the Mahakam Delta resulted in a carbon loss equivalent to 226 years of soil carbon accumulation in natural mangroves. 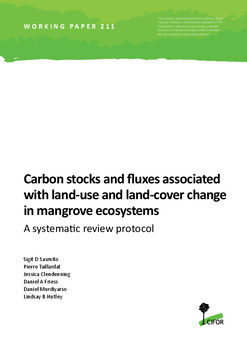 Conservation of mangroves are of great value for inclusion in climate change mitigation strategies because of their large carbon stocks, the large carbon emissions generated from land use, and the potentially long period of time required to recover carbon stocks following abandonment.